Amelia Conolly, 31 from North London shares her experience of volunteering with the Volunteers Supporting Families project in Croydon. “I was at university, studying a fashion degree when I first considered volunteering. I’d realised fashion wasn’t what I wanted to do long term and was exploring other avenues. I’d tried teaching and knew that wasn’t for me but still wanted to work with children in some way so I switched to a child psychology degree. “I came across the Volunteers Supporting Families project which enables volunteers to mentor and support families with complex needs such as alcohol or substance misuse or where children are at risk of significant harm through neglect. Volunteers make weekly visits to the families building up a strong relationship with the parents, listening to their problems and offering practical help. “I supported three families over the course of my time with Volunteering Matters. They were all very different and presented different challenges. “The first family didn’t want to engage. They would be out when I came to visit, missed appointments and didn’t seem like they were willing to talk. I didn’t know if I was going to be able to make a difference and it’s hard not to take that personally, although it’s not personal, they just weren’t ready. “The 2nd family were more engaged and despite their challenges they were still open to receiving support. “The 3rd and final family were in a different situation. They made some progress during our time together. 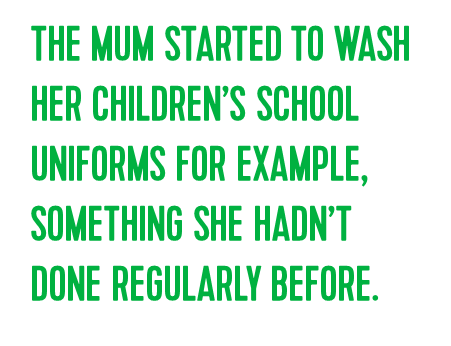 The mum started to wash her children’s school uniforms for example, something she hadn’t done regularly before. I felt I was able to offer some practical support for them. It was a complex situation though and in fact, their situation escalated. Despite this I feel our time together was of some benefit. I was able to advocate for the mum – this meant a lot, especially seeing as she had experienced relationships with several different social workers. It was extremely valuable to have one person who was consistently there. “Each family had their own challenges and I feel I was able to help in small ways. One mum had been prescribed antidepressants but wasn’t taking them. I asked her why and it turned out she just had trouble swallowing tablets and needed the medication in liquid form – it wasn’t because she was refusing the medication. She hadn’t felt able to tell anyone this previously. “I knew I wanted to get into social work – volunteering really cemented that. The hardest thing is recognising that the family are capable of achieving small incremental changes but may not be able to accomplish the overall targets that are set for them. “I ended up achieving a 1st in my degree and think that volunteering helped with that in part. I’ve been accepted on the Frontline programme which I’ll be starting in July and in the mean time I am working as head of operations for a charity. Volunteering has been a great experience and has had an impact on my work and education. “I think volunteering is a way to create positive change for others and self. Through volunteering I was able to explore a potential career and see if it was right for me. It totally shaped my path to Social Work and meant I knew it was what I wanted to do and was more dedicated in my decisions to study and work in the field. “It also created a positive sense of self through being able to give something back to the community in which I grew up in and it was hopefully a positive experience for the families I worked with too. In addition you get to meet some wonderful professionals and this has also been a huge positive in that I may well meet them again in the future or be able to recommend or turn to them for inspiration or advice. Amelia was based in London and volunteered with families in Croydon from 2014 – 2016. If you enjoyed reading Amelia’s experiences, and would like to read more about Volunteers Supporting Families go to the project page.